The giant panda (Ailuropoda melanoleuca) is a flagship species for endangered species conservation. Once distributed across southern China and Southeast Asia, and historically covering a vast territory, the surviving pandas today belong to several divergent genetic populations located only in Shaanxi province or Gansu and Sichuan provinces, respectively. Genetic reconstructions based on present-day panda populations likely do not accurately depict their evolutionary history, but no mitochondrial (mtDNA) and nuclear genomes have been retrieved from ancient giant pandas to give a different story. 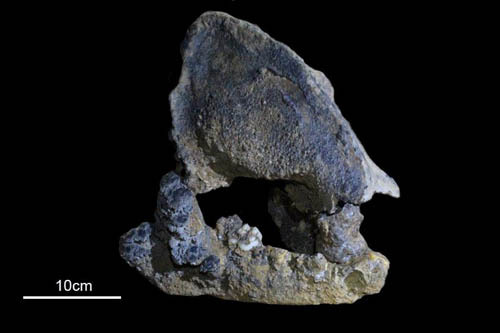 This has changed with a new study in Current Biology (https://doi.org/10.1016/j.cub.2018.05.008) led by Professor FU and her team in the Molecular Paleontology Lab at the Institute of Vertebrate Paleontology and Paleoanthropology (IVPP), Chinese Academy of Sciences. 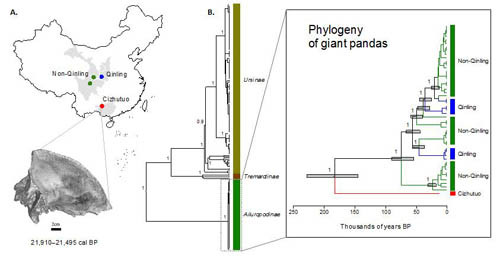 In this study, they sequence the complete mtDNA of a ~22,000-year-old giant panda specimen. 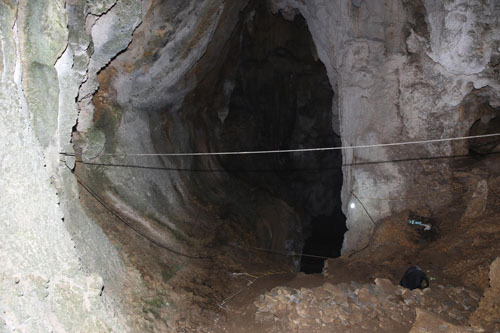 This giant panda was found by Professor ZHANG Yingqi at IVPP and the caving team (Beijing Caver ) in August 2014 at the Cizhutuo Cave located in the Leye County of Guangxi Province in China (Figure 1-2). That it lived around the time of the Last Glacial Maximum (LGM) makes it the oldest panda genetically sequenced to date. Due to the hot and humid conditions of southern China, DNA preservation is very difficult, making it hard to reconstruct genetic data from ancient specimens, especially those more than a few thousand years old. The success of the FU Lab in sequencing the complete mtDNA of a panda from the LGM is mainly due to their use of ancient DNA capture techniques to enrich for the tiny amount of DNA that may still be present in bone material. Using their newly sequenced mtDNA, they compared it to the mtDNA of 138 present-day bears and 31 ancient bears. They found that the Cizhutuo specimen’s mtDNA is genetically closest to present-day pandas, relative to other bears, with pandas and other bears sharing a most recent maternal common ancestor around 12-8 million years ago. However, its mtDNA falls outside the mtDNA variation found in present-day pandas. It lies on a distinct mitochondrial lineage, suggesting that the population to which it belonged coexisted separately alongside the ancestor of present-day pandas. Ko et al. estimate that the separation between the maternal ancestors of the Cizhutuo and present-day pandas dates back to the Middle Pleistocene (227,000 – 144,000 years ago), much older than most recent maternal common ancestor of pandas today (94,000-55,000 years ago). They also find eighteen amino acid changes between the Cizhutuo and present-day pandas in the coding region of their mtDNA, further supporting that the Cizhutuo panda had a distinct mtDNA lineage. These amino acid changes are potentially related to its habitat in Guangxi or differences in climatic adaptations during the Last Glacial Maximum. With just maternally based data, the history of past pandas is already shaping up to be more diverse and distinct than previously known. However, mtDNA is essentially one data point, while nuclear DNA undergoes recombination, mixing the nuclear DNA from both parents in subsequent offspring, which allows access to tens of thousands of data points that is much more representative of the average population history. The technical achievements in this study hints that obtaining ancient nuclear DNA for the giant panda is on the horizon, and these future data will be vital to accurately study the past evolutionary history of giant pandas. This research was supported in part by grants from the National Science Foundation of China, the Chinese Academy of Sciences and the Howard Hughes Medical Institute. Fig. 3 (A) Location of the Cizhutuo specimen and computer tomography scan of its skull, (B) Mitochondrial phylogeny of giant pandas, enlarged from a phylogeny for all bears, showing that its independent mtDNA lineage shared a common ancestor with present-day panda populations deeply in the past, ~183,000 years ago (Image from the study).